Do you determine all on your own which direction to take with each new instalment? No, first I gather ideas. In the case of Tales of the Abyss, Higuchi-san6 - the director - and I thought we wanted to do something involving a good-for-nothing who saves the world and his comrades, all the while saying, “Aw man, what a pain…” Sort of like Ikebukuro West Gate Park.7 (laughs) 6Mr. 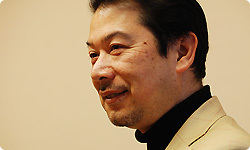 Yoshito Higuchi: A member of Namco Bandai Games Inc. Chief director of such games as Tales of the Abyss and Tales of Symphonia. 7Ikebukuro West Gate Park: A series of fiction novels published in Japan by Ira Ishida featuring the main character Makoto Majima and set in Ikebukuro, Tokyo. The characters in Tales of the Abyss include the main protagonist Luke and Asch, who are just like two sides of a coin. The world revolves around the relationship between these two. Two or three of us make a foundation for what we want to convey to the players regarding the story and characters. I suppose it wouldn’t hold together if more people did that. After establishing those core elements, you dole out the work. Right. We gather ideas after that, too. For example, if the scriptwriter suggests a certain type of character, we say, “Shall we expand on it like this?” and add on new ideas. The ones who establish the original core of the game select from among the new suggestions. Right. If the original direction isn’t firmly established and it starts to branch out in all directions, the story becomes weirdly disjointed. I want to make it so everything is connected and rounded out so players won’t be confused. What process is important in breathing the essence of the series into one of the games? Hmm, it’s difficult to say. I think every long series has an essence. Without that, there is no unique quality bearing it along. What in your eyes determines the essence of the Tales series? Have a number of the same people been working together in the Tales development studio, so that what they make naturally turns out to have the Tales flavour? Yeah, but the way we make the games hasn’t changed for a long time. Even when the staff did change, certain key elements were passed on. Right now, Baba-san8, who made Tales of Graces9, is often central to development. At first, his output didn’t feel quite right, but now it feels just like Tales should. 8Mr. 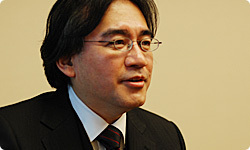 Hideo Baba: Producer of Tales of Graces. 9Tales of Graces: An “RPG to Know the Strength to Protect” released for the Wii console in Japan in December 2009. He grew accustomed to it. Yeah. I’m not sure what that is… It’s difficult to put into words. After 15 years, Tales fans have found their way onto the workforce, but I feel like what fans value and what developers value aren’t the same. When fans come on board, a phenomenon occurs in development that is similar to what happens when the voice of the market pulls the game off course. How do you handle that? Recently, a lot of female staff members have joined the Tales studio because they like the Tales series or RPGs in general. What are the male and female percentages for Tales players? According to questionnaires, about 70% of the players are male and 30% are female. But when it comes to stage events and merchandise sales, about 95% are women. Yeah. It’s quite surprising. When women join the staff, many of them have a love for the series that springs from a viewpoint similar to that of the fans. That love must be incredibly strong and full of good intentions. But when they say, “This is what we should do,” I often have to clamp down on it. Especially when their viewpoint as a fan is strong. That goes back to what we discussed earlier. As a series builds up, you can’t simply respond to the fans’ requests. It’s important to present something the fans were never expecting, while not losing the core essence. That’s right. I hate how when you listen to various opinions, it becomes harder to depart from the fans’ requests and to do something bold. Whatever the situation, I want to have the stomach to - in a good way - betray the expectations of the fans. Betrayal that makes the fans happy!